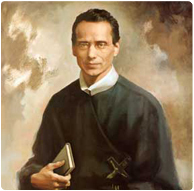 The Redemptorists » Blessed Francis X. Seelos, pray for us! Happy Feast of Blessed Francis Xavier Seelos! Today we celebrate a Redemptorist missionary who, like many of his elder brothers in the Congregation, left his home in Europe to minister to the lost and forgotten in the New World. Blessed Seelos was a mission preacher, pastor, novice master, and spiritual director during his time. He served alongside another great Redemptorist, St. John Neumann, and spent time in both Baltimore and Annapolis. Seelos contracted yellow fever and died in New Orleans in 1867. He was beatified in 2000, and in 2009, the Archdiocese of Baltimore opened its investigation into an Annapolis woman’s supposed miraculous cure from cancer thanks to the prayers of Blessed Seelos. If her cure is accepted as a miracle by the Vatican, Seelos would be declared a saint. For more information about Blessed Seelos or to visit his shrine in New Orleans, LA, visit www.seelos.org.